Wedding receptions normally last between three to five hours. A careful planner should make a timetable. It is going to help everyone involved with your wedding including your guests, your caterer, the band, and the photographer. Keeping with the planned schedule can enhance your and your guests' overall experience. sequence of events for your reception. Spending time and effort before the wedding can save you from a lot of confusion and unnecessary distractions on your wedding day. You can expect better results from any plan that is put in writing. Be sure to give a copy to your wedding vendors, your wedding attendants and family members so they know where they need to be and when. Be as detailed as possible when preparing your reception itinerary. Include names, the order of events, specific locations and song titles of special dances. As you prepare your schedule, don't be too concerned about exact times. The times on your schedule should act only as a guide and to keep things moving in the right direction and make sure that everything gets done! The order of events is more important than the time of events. The order of events is up to you, but once established you should stick with it. Because wedding guests should not begin dancing until after the bride and groom have had their first dance, some brides prefer to do their first dance with their husband very early into the reception, before dinner is served. Other brides prefer to do it after dinner, when the "real dancing begins". If you put in the effort to have every minute planned out, you should complete the process by preparing a printed wedding and reception schedule for your guests. Include the approximate arrival time of the bride and groom, first dance, cake cutting, special toasts to the bride and groom, picture taking, tossing of the bride's bouquet and garter, etc. 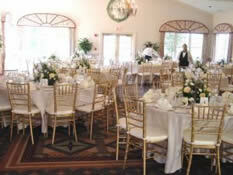 Getting everything organized ahead of time helps you and your guests to have a lovely wedding reception.